Coloration varies a LOT throughout the season. Factors in coloration include : Climate, amount of sunlight, crop maturity, region of production etc... Varieties will not always look as pictured... speak to your representative for more information. A large family of South African natives in the Proteaceae family commonly known as Conebushes which are available in a multitude of shapes, textures and colours. 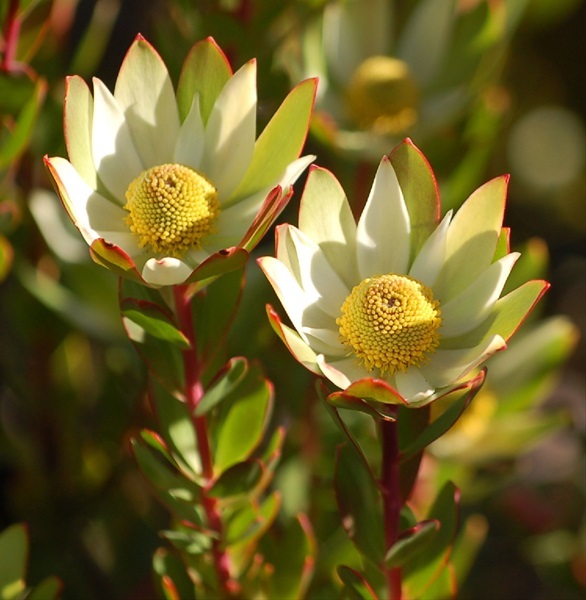 Leucadendron are most widely available from California from October to May and from Australia, South Africa and N.Z. from April to October. Leucadendrons are long lasting with a vase life of 7 to 21 days depending on the variety. Many varieties go through a flower stage and a cone stage as a cut flower, this means that at times no cone may be inside the bloom. In addition, may varieties change colour through the season from green to yellow or red. 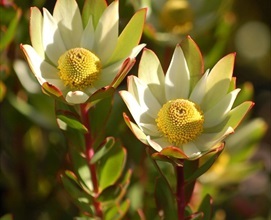 Leucadendron is graded by stem length and as singles or sprays. Most varieties are bunched by 10 stems, but many of the larger headed varieties are bunched by 5 stems. Lengths usually depend on variety, but can range from 50 to 100+cm. Many new varieties are being commercialized each year out of California,Australia South Africa and New Zealand with interesting colours and forms. Foliage should be green and free of marking. Smaller florist size boxes containing 10 to 12 bunches are increasingly popular.